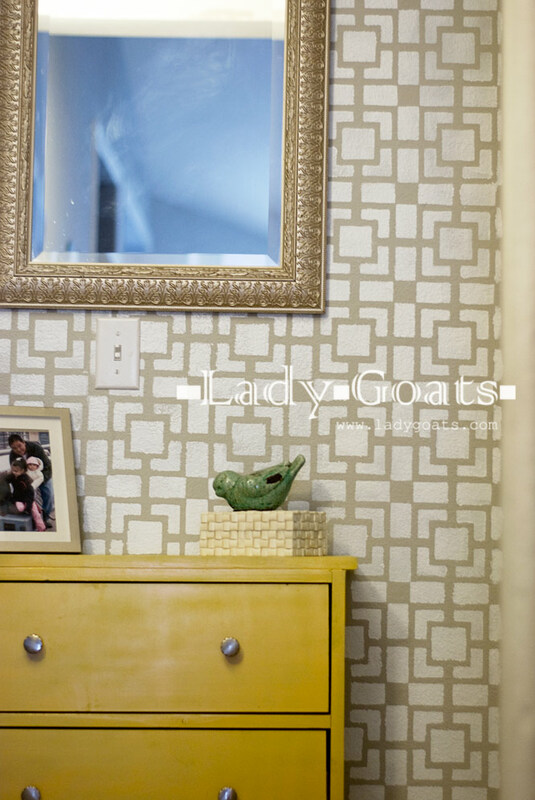 Lady Goats: Stencil Me This... & a Giveaway! Stencil Me This... & a Giveaway! Did I just type "giveaway"? I need to just get over the fact that I'm going to do giveaways, don't I? Too many awesome companies want to give my amazing readers a chance to get something for free. I can't say "no", I'm sorry! Have you gathered what the giveaway is yet..? That's right, Cutting Edge Stencils is giving you guys a chance to win a stencil up to $50 from their site. But before we get to the giveaway details, I really wanna tell you about my experience with stenciling. After watching the how-to videos and reading the instructions, I grabbed a piece of chipboard to perfect my stenciling technique. 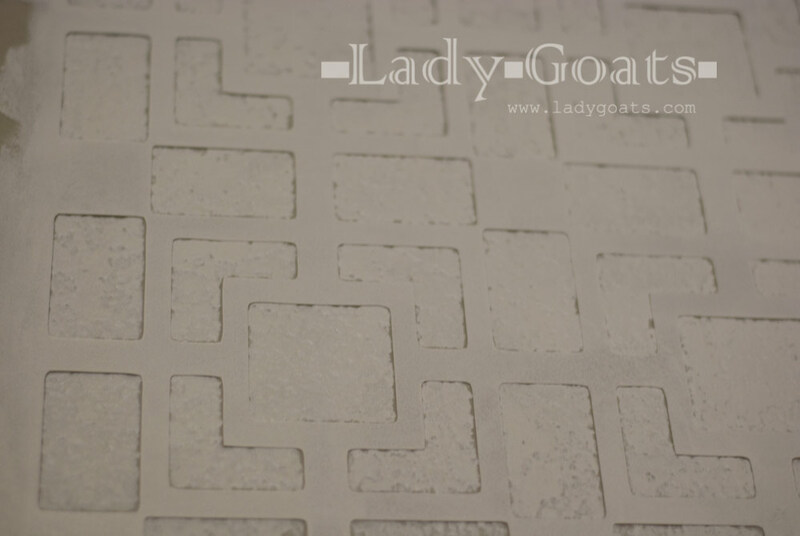 It was pretty straightforward; leave very little paint on the foam roller, use spray adhesive on the back of the stencil so that it would stay on the chipboard without moving and then lightly roll the paint onto the stencil. 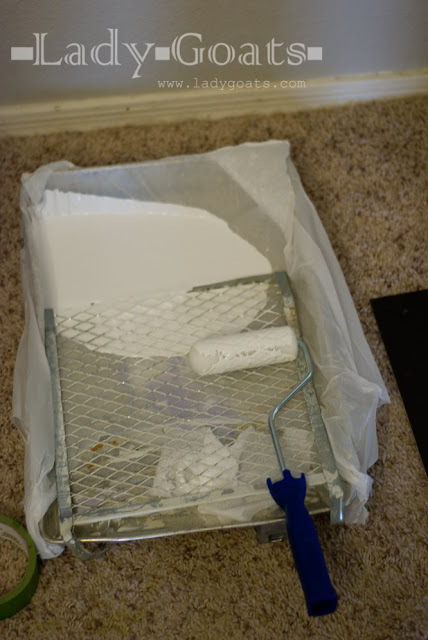 I lined a paint tray with a grocery bag, put a tiny bit of paint in and then used the grate (is that what it's called?) 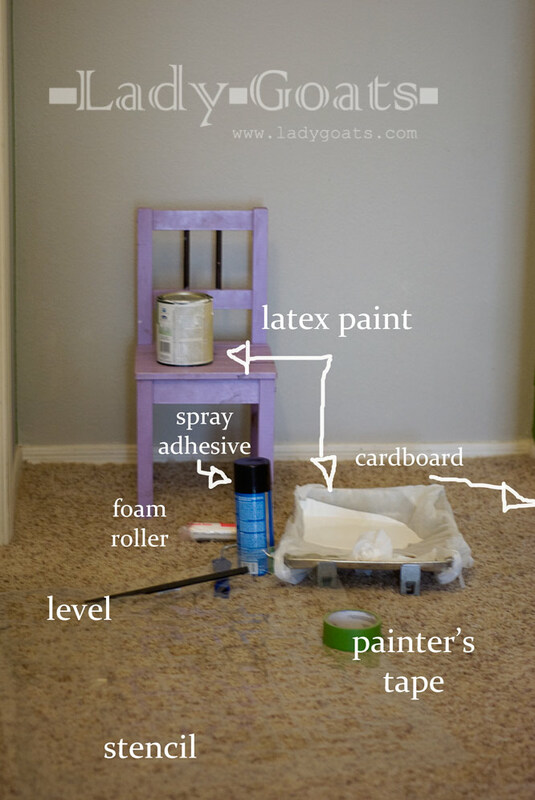 to get most of the excess paint off before wiping even more of the paint onto cardboard. Remember, practicing told me that I needed to get most of the paint off of the roller and then roll it gently. After moving onto my textured wall, I realized that all of my practicing was a waste of time. Now, I don't think that my walls have a deeper texture than is typical (for textured walls, I should add), but there is no way that lightly rolling a nearly paintless foam roller was going to get into the texture. I looked at the FAQs on Cutting Edge Stencils' website and found this tutorial (by Lindsay at Makely) for stenciling textured walls, and I think that Lindsay may have been onto something with using the nap roller. I couldn't go get a nap roller, so I had to try my best to make do with what I had. 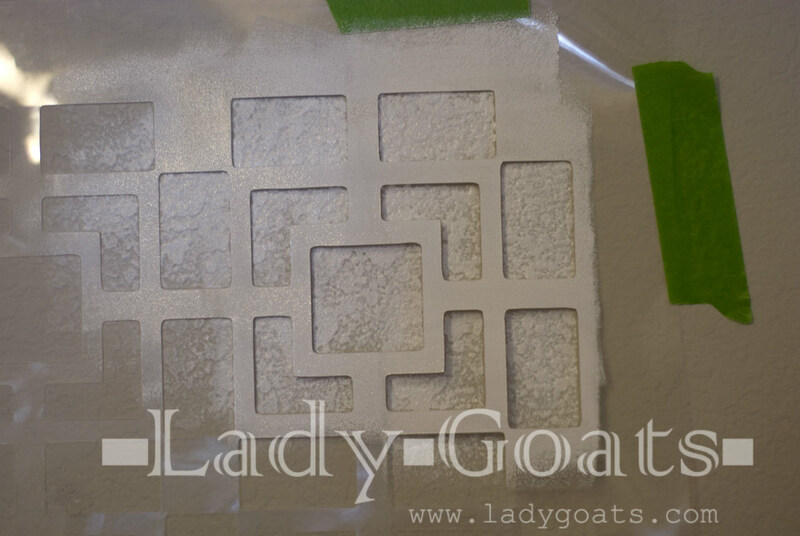 Made sure to use spray adhesive, press the stencil firmly onto the wall, and roll from the outside in, doing my best not to push the paint under the stencil. It still didn't look very pretty, and it was very obvious that I wasn't getting the paint deep into the texture (especially near the outside of the openings), so I grabbed a 1" foam brush and brushed from the outside of the openings in toward the center so that I didn't push paint under the stencil. This is a pretty typical shot of the wall. Most of the edges are fine, but there are definitely spots where there is seepage. 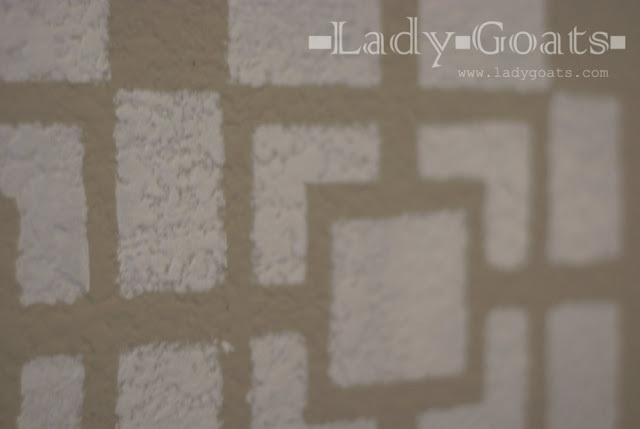 Embrace the seepage, it's going to happen on textured walls. Fortunately it isn't very noticeable in the grand scheme of things. And I'm very thrilled with the turn out. 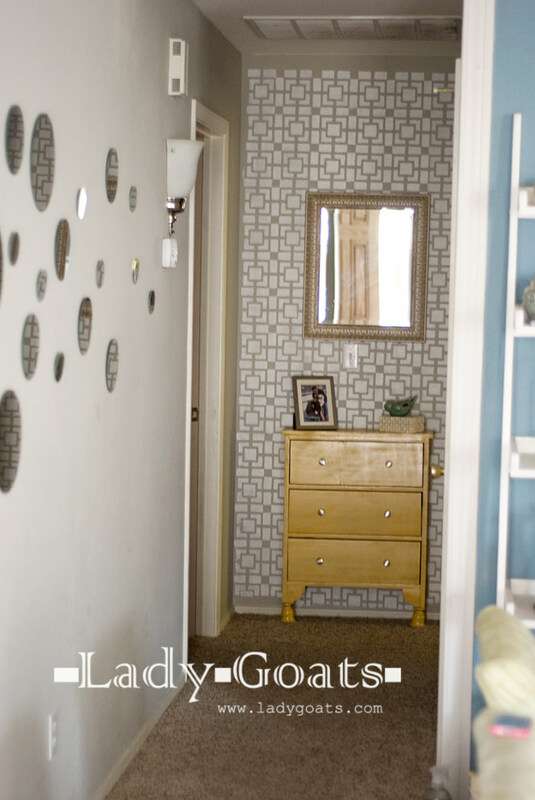 I plan on writing another post on the hallway itself (*psst* it's done! check it out here), so for now, let's get to the giveaway! There are so many cool ones, but I would love to do this stencil on some pillows for my bed. NOw I need to go back and look some more! OMG- just got off of pinterest! I could spend hours looking at CE pictures. SO many neat ideas. I love all the geometric stencils but I think Athena Allover stencil is my favorite. Really pretty. I wondered where you have been. I have had a stencil for months and months and I have yet to do it. Maybe this post will motivate me. The problem is the wall I have picked out to do is huge. Well you have inspired me in more ways than one. Not sure if it will be a good thing or a bad thing, (the project, not your inspiration, ha!) I've decided instead of stenciling that huge wall, I'm going to do the hallway, above the chair rail. However, the huge wall would probably be easier, as I will now have to stencil around 8 doorways, yikes! However, even before that, this is the one place in the house that I've yet to paint because I never decided on a color. Might go totall neutral, but still have to decided. I will use either washable flat or eggshell and then stencil in a high gloss with the same color. I have put off stenciling this long because I know it will be a lot of work and am not looking forward to it. I'm much lazier than you claim to be! Love this look, really makes the end wall stand out! I love the anemony grande flower stencil and the lily scroll!